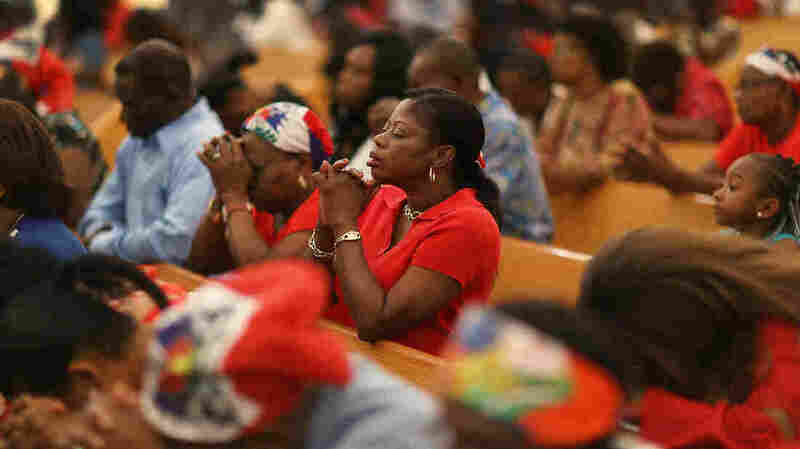 Haitian Immigrants Lose Temporary Protected Status, DHS Decides The Department of Homeland Security announced that Haitians living in the United States since a catastrophic 2010 earthquake will have to return to their home. A May prayer service at Notre Dame D'Haiti Catholic Church in the Little Haiti neighborhood of Miami touched on the fate of Haitians under temporary protected status. On Monday, the Department of Homeland Security decided to let the protection expire. It adds that the decision by acting secretary of the Department of Homeland Security, Elaine Duke, follows then-Secretary John Kelly's announcement that Haiti was recovering and that the status likely would end after a final six-month extension issued earlier this year. "Since the 2010 earthquake, the number of displaced people in Haiti has decreased by 97 percent," the statement said. "Significant steps have been taken to improve the stability and quality of life for Haitian citizens, and Haiti is able to safely receive traditional levels of returned citizens. Haiti has also demonstrated a commitment to adequately prepare for when the country's TPS designation is terminated." "Haiti is in a really bad condition," Peterson Exais, a high school junior in Miami with TPS, said on a press call with reporters. "I would like to call on Congress to please, please make your choices wisely. This decision is very selfish. I am a human, you are a human, this is my home, and America is my home. I consider myself American in every way except the papers I don't have." "I think it's a tragedy on a few levels," Murray said. "Certainly for the Haitians who have been living and working here to support their families, but also for the communities and employers who've come to know them and rely on them as trusted neighbors and employees. " Thousands Of Haitians Enter Canada Amid Fears Of Deportation From U.S.
Murray says she is baffled that Haiti was not deemed to have met the criteria for TPS. She points out that hundreds of thousands of Haitians are still in need of housing as a result of the devastation from the earthquake in 2010. "Just six months ago the Department of Homeland Security recognized that Haiti continued to meet the criteria for designation based on the earthquake, as well as subsequent conditions," she said. "Since then there have been two hurricanes and an emerging diphtheria outbreak." Murray says there is growing pressure and efforts to find a legislative solution for families like these, who are deeply rooted in the United States. More than 325,000 people from 10 countries have temporary protected status and have lived in limbo for years, sometimes decades.